The father of councilman Shahin Khalique who passed away two years ago is recorded as having cast a ballot in the city’s 2nd Ward election which took place in May of this year, according to a review of election records. Khalique’s father Abdul Khalique, who died on July 20th, 2014, is listed as having voted in-person at the District Five polling site in the 2nd Ward on May 10th, 2016, according to Passaic County election records. 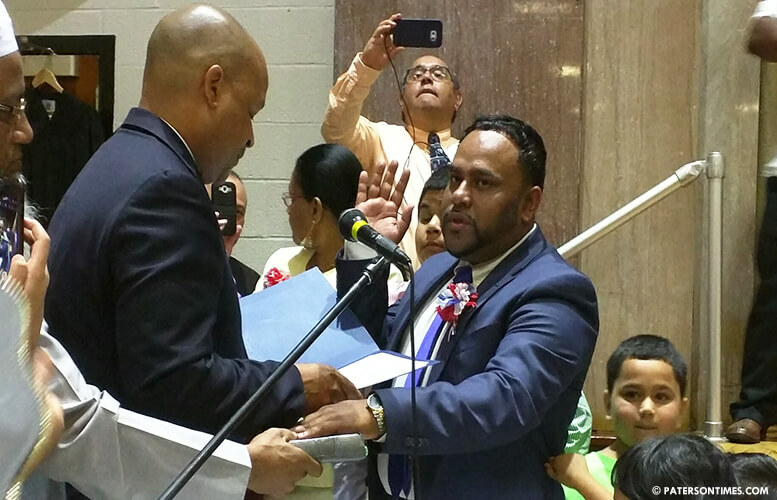 Shona Mack-Pollock, the deputy superintendent of elections in Passaic County, confirmed an Abdul Khalique domiciled at 19 Rossiter Avenue voted in the 2nd Ward election. “My father did not vote,” said Khalique. He said there are several people in the 2nd Ward who have the same name as his father, one of whom may have mistakenly utilized his father’s name to vote. Including his father, there are four people with that name on voter rolls as having cast ballots in the 2nd Ward election. He pointed to one particular Abdul Khalique who resides at 385 Preakness Avenue. “He voted at the same center. He probably signed in the wrong place,” alleged Khalique. He said it appears to be a case of mistaken identity. If the Abdul Khalique from Preakness Avenue “mistakenly” voted under the councilman’s father’s name the records would show one vote. At present, both the deceased and the alive Abdul Khaliques are listed as having cast ballots in the 2nd Ward, say the councilman’s opponents. Former councilman Akhtaruzzaman lost to Khalique by 20 votes in that election. He has since filed a trove of documents in the New Jersey Superior Court alleging widespread voter fraud in the May elections. This case is scheduled for trial in mid-September. The Passaic County superintendent of elections Sherine El-Abd opened an investigation into accusation of voter fraud prior to the election. Her office has expanded this investigation several times as more and more issues emerge delaying a final report. She is on leave this week. “I highly doubt that he would do such a disgraceful and illegal tactic as to use his dead father’s vote to win an election,” said Akhtaruzzaman in disbelief. When asked if his campaign had anything to do with it, Khalique emphatically denied it. “My campaign had nothing to do with it,” said Khalique. Akhtaruzzaman wasn’t the only one shocked by the revelation that a deceased individual voted in the 2nd Ward election. “No way. Oh my God. Wow,” said former councilman Aslon Goow. He said he heard rumors, but did not believe it. He was surprised that it was an in-person vote rather than a mail-in ballot. The councilman’s deceased father’s name remained on the voter rolls because the family did not report he had died and request his removal from the list. “If we don’t get that information from the family then we can’t delete the person from the system,” said Mack-Pollock. A reporter visited multiple grave yards to verify the death of Khalique’s father. “Vital statistics are not public information,” said Corinne Marotta of the Wayne Township clerk’s office in response to a request submitted to verify the death. Khalique’s family’s lived in Wayne prior to moving to Paterson. Khalique suggested it’s not his job to notify the election officials about the death of his father. “It’s the job of the election commission,” he said. Mack-Pollock said the other way the county is able to delete deceased voters is by confirming their death with state data. However, in this case, a conversion error left the father’s birthday as 1800, in election records. “We can’t confirm it if we don’t have the exact date of birth,” said Mack-Pollock. She said the sample election ballots ask residents to return ballots if the person does not live at a particular address or is deceased. Both Jay Rahman and Paterson Times are the scum of earth trying to create a story where there isn't one, and dragging my deceased in it. My fathers name was Abdul Khalique and when he was alive his polling location was at Don Bosco. My friends fathers name is Abdul Khalique as well and his polling location is also at Don Bosco, and also note that there are 5 Abdul Khalique's registered to vote in the 2nd Ward. Further more, my fathers signature was a cursive signature and the other gentleman signature is a printed signature all in blocks. We even took a step further and sent my team of investigators to Mr. Khaliques residence on Preakness Ave to corroborate that the signature was his and that in fact he had signed on the wrong spot on the book. The Shame goes to my opponent he knew first hand, and still tried to drag my father into a cheap story, and both Jay Rahman and Paterson Times who did not do their due diligence because of their continued bias towards me. I have sat here for more than 1 year and allow for Jay Rahman and Paterson Times to besmirch my name, but I will now allow them to Muddy up my fathers legacy. I will be filing a law suit against Jay Rahman and Paterson Times and my team of lawyers will have a field day with this non story and many others. Mr Khalique, both you and your brother are the scum of the earth by trying to bring Bangladeshi corruption to New Jersey. We all know what you did. We all know how two illiterates like you and your brother made their money and yet disguise yourselves as good Muslims. You eventually shall have your reward! Ha! Bring corruption to NJ? NJ IS corruption, and Paterson is one of its biggest star players. Thanks to folks like Shahin, Shelim, and the dead father Khalique. It's disgusting. I hope they both wind up in prison where they belong. why do so many of your people have the same exact name in such a small area? this dude from your photo was born 1/01/1111? maybe if they had the correct birth date on these certificates it would be easier to establish who signed what. while you're here,serious crime has spiraled out of control in our once quiet ward,since you have been elected.what are you doing about this? & filthy,unkempt properties.people not recycling,people leaving standing rainwater collecting in the piles of rubbish on their properties,allowing mosquitos to breed out of control,illegal dumping everywhere- & all the other things. all this election drama/lawsuits is taking up all of your time & should be taking a second place to the problem needing immediate attention affecting residents under your watch as "our" councilman. Regardless of whether or not this particular story is true, one thing is for sure, and that is Paterson is the laughingstock of New Jersey! Do the people from other countries who want to live here, are they fully aware of how hopeless this city has truly become? I really wonder. i don't understand our system. we have top quality technology yet we can't keep track of those who died? the minute a person dies,the government should immediately put it in the system & freeze ss# etc, so they aren't used in fraud or any other purpose. this would not just help in elections but also would cut off all those using dead people's identity to get social services. not that they do anything about it if someone calls to report it,as a neighbor did. To began with: Shahin Khalique does not have the academic volume to register below paragraph. Just have a normal verbal conversation with the guy, you will know….(FACTS). MESSENGERS!!!! This Demon got hand full of LAIRS. PUNISH him for your acts. Seek forgiveness and quit worshiping SATAN. "There is always time to fix things" you just gotta have the will and faith in a religion. A statement your money can't buy. Listen to this LAIR and i assure you that this guy is capable of using DEAD for his greed.